It’s been a while since I’ve sifted through a group of new-to-me iPad apps, so I have a long list. If you want to read descriptions and criticisms of these apps and many others, follow the menu at the top right corner of this web page. As I sift through educational apps, trying to identify the best options for my students, one question often ask is how much children meaningfully interact with a software. How much are they manipulating content, moving things around, and solving problems? How much time is spent watching passively? There is a tendency among many developers to make apps that have the look and feel of a television show. Children are asked to choose an answer or respond in some way, then they watch a five or ten second animation. Why not? Children like television. It’s rewarding. Perhaps there’s a place for such rewards in educational software. But if it looks like candy and taste like candy, well maybe it’s candy. The American Academy of Pediatrics (AAP) recently published recommendations for limiting screen time for children. Their perhaps strongest recommendation is to eliminate “television and other entertainment media” for all children under the age of two. There is significant evidence that such media negatively affect a young child’s brain development. For older children, the AAP recommends at most one or two hours per day of “high-quality content” media. Researchers have begun to draw distinctions between active screen time (e.g., playing video game) and passive screen time (e.g., watching television). Many experts have discussed the potential benefits of playing video games. And some research has compared television to video games and found that video games are favorable. There isn’t yet much data to support any conclusions. But it seems there’s a growing consensus that being active in front of a screen is less harmful and/or more advantageous than being passive. If we accept that active screen time is broadly favorable, can we then apply that idea to more specific cases? Can we declare that a more interactive app is a better choice? Is an app that has children watch passively 10 percent of the time better than an app that has them watching passively 20 percent of the time? These are important questions, because there is incentive to include videos and animations in apps. Children like them, and whatever children like can be sold, whether or not it educates well. Take a glance at some of the top grossing educational apps and you’ll find examples. Faced with a lack of definitive answers, I choose to avoid software that looks and acts too much like television. Whether in front of screens or not, I want my students to demonstrate what they understand and what they can create. Children can learn passively, but passive learning rarely fosters the deepest level of understanding. Sorry kids. I know you like it, but there’s no place for television in my classroom. I recently got in touch with educator and researcher Harry Walker. He spent years developing, revising, and establishing the validity of his Evaluation Rubric for Mobile Apps (which forms the nice little acronym, ERMA). He administered a couple rounds of surveys to a couple hundred experts around the U.S. and a few other countries, and tested the rubric’s validity. Walker has been kind enough to share his rubric with me and with you. While there are a handful of rubrics being used out there (nicely summarized here), few if any have undergone such rigorous testing. In developing his rubric, Walker has established a foundation of research for us to build upon, which the fast-moving field of educational technology so often lacks. For that, I am grateful. 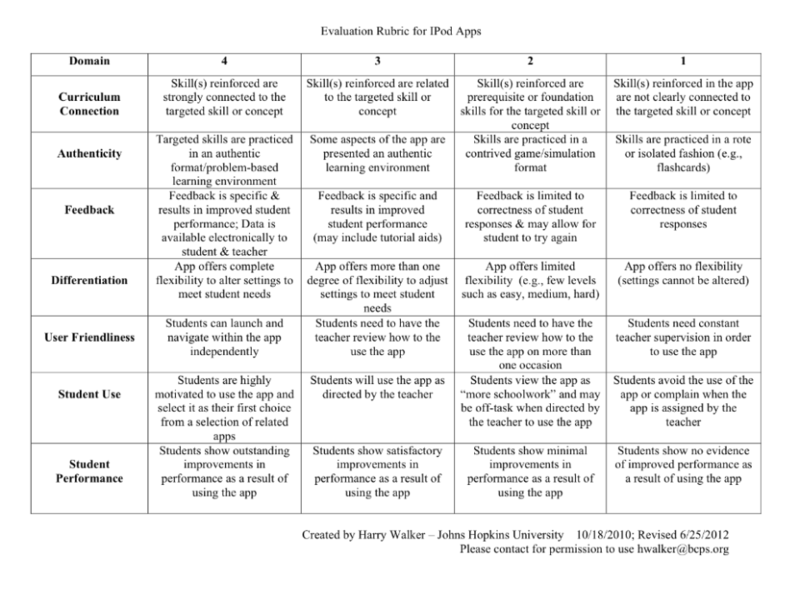 Take a look at Walker’s rubric below, and read some of his thoughtful insights on his blog, I Teach Therefore IPod. I have rigorously sifted through another group of educational apps and added them to my lists of summaries and recommendations. As always, click on the links at the top of this webpage to read my descriptions, comments, and criticisms for these apps, along the rest of my app summaries and recommendations. There is a growing trend in education to make learning activities more game-like. It is sometimes referred to as gamification or edutainment. Although educators have been turning their lessons into games for a long time, recent technology seems to have accelerated the shift. Learning activities today often resemble video games to the extent that there’s a fine line between the two. The goal of gamification, of course, is to provide a fun and rewarding learning experience for children, so that they spend more time learning and their interests grow. A growing body of research (meta-analyzed here by SRI International) suggests that digital games positively affect academic outcomes. This rings true in my anecdotal experience. I have had many students who are disinterested in even the most exciting of my manipulative activities, but who clamor for the chance to try the same types of activities in a game-like app. And even the easiest-to-teach students — the students who are eager to learn from any type of activity — seem to learn more quickly when there’s an app that ties into our lessons. However, I hesitate to embrace gamification wholeheartedly. Maybe it’s partly that I have yet to overcome the knee-jerk “waste of time” reaction that many parents and educators have when they think of video games. But there are a couple of reasons I think game-like learning is only a piece of the puzzle, not the answer to all of our problems. There is growing competition to make educational apps more and more entertaining, and the result is often a reduction in their educational value. Apps vary to a great degree in how they incorporate game-like attributes. Some remain highly focused on academic skills but have included prizes, short games, or animations as rewards. Others, on the other extreme, look very much like video games with perhaps an occasionally inserted math problem or literacy activity. The former I would compare to nice bowl of oatmeal with a touch of sugar in it. The latter is more like a lollipop with a tiny little bit of fruit juice. The problem is that, in the minds of young children, oatmeal is no match for lollipops. If I introduce those candy-like apps that are very fun but teach little, then my students will be less interested in other apps that are less exciting but more educationally valuable. I acknowledge some oversimplification in the above argument. Many apps successfully integrate valuable lessons and entertaining activities. There is certainly no single “educational vs. entertaining” continuum on which apps can be placed. But I have seen a number of candy-like educational apps that are very successful. And I hear of teachers using those apps despite my confident assessment that they have little educational value. It seems there is often greater incentive to create apps that are entertaining than to create apps that are educational. Junk food sells, but it’s not good for us. So says Calvin’s dad in the old “Calvin and Hobbes” comics, whenever something boring or undesirable must be accomplished. Though it’s not what children would want to hear, some percentage of their learning should be challenging to the extent that it’s not fun. Not everything should be a game. At some point down the road, there won’t be rewarding games for all the lessons students need to learn. Nobody is designing games to make my job fun and rewarding. Much of my motivation comes from within (though the steady paycheck helps). The ability to overcome boredom and find such motivation is a skill that requires experience. That struggle makes makes us stronger, and in many cases it makes for memorable and therefore powerful learning experiences. Granted, I teach four and five-year-old students, so it sounds ridiculous that I would suggest they be made to struggle on a daily basis. Like any teacher, I always want to find that happy medium between too easy and too hard. But I do strive to regularly provide significantly challenging experiences in the classroom, and with tablets that sometimes means using an app without bells and whistles. For example, we use the app Number Pieces to help foster an early understanding of place value in two and three-digit numbers. The concept is challenging for young children, and the app (which I highly recommend) is essentially a blank slate — it has no questions and answers, much less rewards and prizes. But I believe it is a valuable activity. How Edutaining Should It Be? The trend toward gamification in education appears to have helped children learn better and faster. It’s not a trend that I would suggest we reverse. However, I think there is a limit to the extent that it should be employed. Where to draw that line will be difficult to determine with much certainty, in the rapidly changing world of educational technology. Tablets have burst onto the educational landscape with remarkable speed. While children clamor to get their fingers on the nearest touch screen, parents and educators must weigh the technology’s exciting potential against a host of unknowns. A few months have passed and my students and I have been able to toy around with some new (to us) apps. I have compiled another set of reviews. A summary is below. As always, click on the links at the top of this webpage to see my reasoning for recommending or not recommending specific apps, and also to see see the rest of my reviews and recommendations. Embrace Technology or Wait for a Research Base? Scientific research on the educational value of apps is nearly nonexistent. The NextGen project is trying to change that, through a painstaking process that includes not just software development but also testing, data gathering, observations of classroom dynamics, interviews with teachers, assessments of children’s learning and controlled comparisons. Tablets are becoming ubiquitous in schools, and at a remarkable pace. The first iPhone hit the market in 2007. A mere 6 years later, a survey of early childhood educators indicates “nearly 3 in 10 classrooms have an iPad or other tablet,” as reported in the article cited above. That is a quick change for professionals in any field. For teachers, it is lightning fast; schools are often particularly slow to change. Scientific research, on the other hand, must move slowly. It requires sound experimental design, thorough evaluations, peer-review processes, and repetition. That rigor is well worth the trouble. Science has brought us to a better understanding of how best to teach children, as it will continue to do. But it takes time, perhaps enough time that a fast-changing technology could become obsolete before its evaluators disseminate their conclusions. Therein lies the dilemma. As a teacher, I can embrace technology as it emerges, trusting the intuition that there is great value in using technology in my classroom. But in doing so, I must rely heavily on my own common sense and rationality, knowing that they will at least occasionally be mistaken. Or, I can set aside my iPads for a while and wait for research to determine which practices have an evidence base. At the moment, it is hard to find middle ground between those two choices. I look forward to the days when we have a better grasp of how best to use technology in education. I am grateful that dedicated researchers, like those at NextGen, are doing their part to gets us there. I have added summaries and reviews for another group of apps. Click on the links to read what I have written about each. And as always, click on the buttons at the top of the page for my extensive lists of app summaries and reviews. I also want to point you to another resource for helping teachers and parents find educational apps. It is called Graphite, it is run by the non-profit Common Sense Media, and Bill Gates thinks it is a valuable resource. Apps will be arranged by both grade level and content subject, and educators will be able to read reviews from other teachers. And instead of worrying about multiple iTunes accounts and credit cards, teachers using Google can draw from a pre-loaded account to purchase apps, then push out apps, YouTube videos, or e-books to students through Google Groups. The content will appear on students’ tablets in seconds. It is hard to get a feel for how Google’s new platform might benefit young children. It may be some time before that can be easily determined.